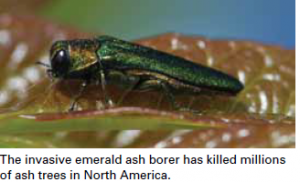 Insecticides to Protect Ash Trees from Ash Borer — Estate Landscaping & Maintenance Service, Ltd.
What systemic insecticides are commonly used to protect ash trees from emerald ash borer (EAB)? Systemic insecticides containing the active ingredients imidacloprid, dinotefuran or emamectin benzoate are commonly used to protect ash trees from EAB. All three are registered for agricultural use and have been designated by the Environmental Protection Agency as Reduced-Risk insecticides for certain uses on food crops. The most widely used insecticide in the world, imidacloprid has been utilized for many years to control pests of agricultural crops, turfgrass, and landscape plants. Because of its low toxicity to mammals, it is also used to control fleas and ticks on pets. Dinotefuran is a relatively new product that has properties similar to those of imidacloprid, but it has not been researched as thoroughly. Emamectin benzoate, derived from a naturally occurring soil bacterium, has been registered for more than 10 years as a foliar spray to control pests in vegetable and cotton fields and parasitic sea lice in salmon aquaculture. Similar products are used in veterinary medicine as wormers for dogs, horses, and other animals.